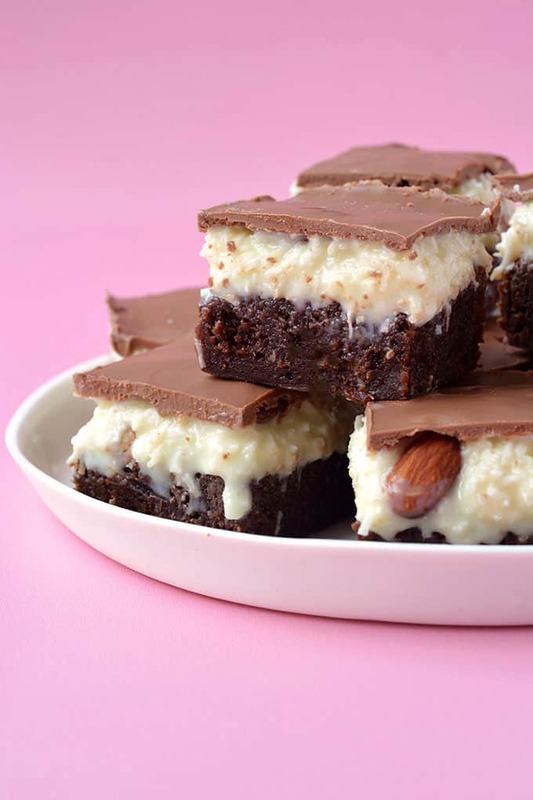 Deliciously fudgy Almond Joy Coconut Brownie Bars perfect for sharing. Topped with creamy coconut, roasted almonds and milk chocolate, these brownies are a truly decadent dessert. Raise your hands if you’re a coconut lover! Well you, my friend, are the prime candidate for these brownie bars. 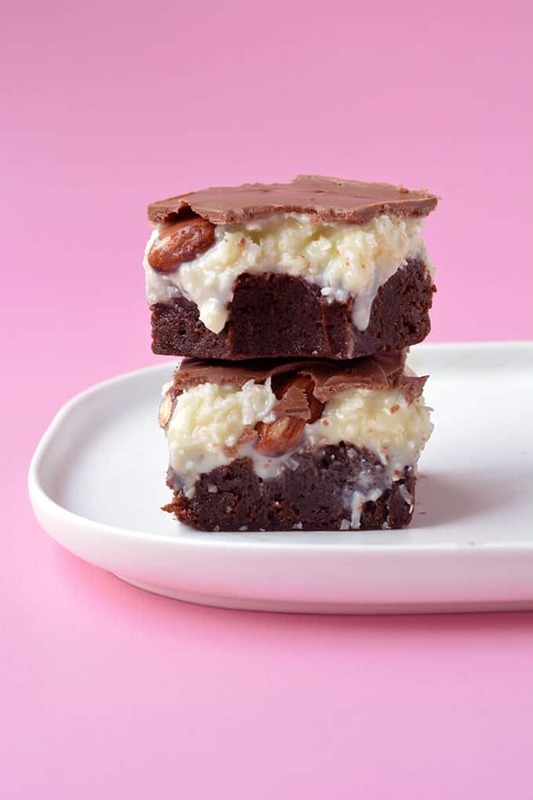 Extra fudgy dark chocolate brownies topped with a sweet coconut filling, a scattering of roasted almonds and a layer of smooth milk chocolate – what’s not to love? This is my ode to the American candy bar, the Almond Joy. I took these brownies to work and received raving reviews. It’s alway nice when that happens because then I know for sure, that they’re as good as I thought they were. I mean I love my One Bowl Cocoa Brownies and my Raspberry Chocolate Brownies, but these Almond Joy Brownies are truly mouthwatering. We’ve taken the beloved brownie to a whole other level. They are super fudgy with chewy edges, while the coconut is fresh and creamy, then there’s the crunch of roasted almonds and the smooth coating of milk chocolate. Yes please. I just love American candy. My friend recently returned from the states and bought me back a bucketload of American chocolate bars, which only took me a few days to devour. But one of them was the Almond Joy. For those fellow Aussies out there, Almond Joys are almost identical to a Bounty bar but with roasted almonds atop the coconut and beneath the chocolate coating – it’s brilliant. However, if you would like to make these nut free, you can simply leave the almonds out, they will still be magical because THAT coconut filling is insanely good. 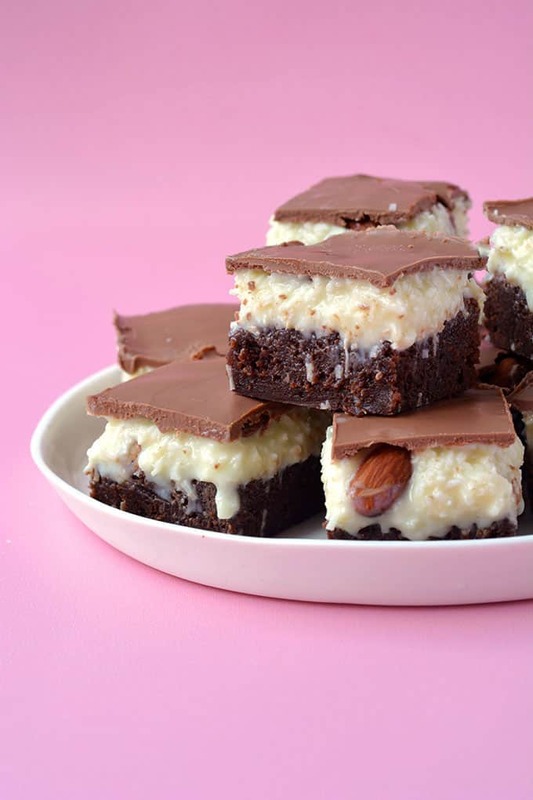 Extra fudgy dark chocolate brownies topped with sweet coconut, roasted almonds and a layer of milk chocolate. Preheat oven to 180 C (360 F). Grease and line an 8 inch square tin with baking or parchment paper, ensuring two sides of the paper overhang. Place butter and chocolate in a heatproof bowl and heat in the microwave until smooth and creamy. Leave to cool slightly. Add sugars and vanilla to the chocolate mixture and stir until combined. Add eggs, one at a time and mix again. Sift in flour and mix until smooth. Pour brownie batter into prepared tin. Very gently smooth the top. 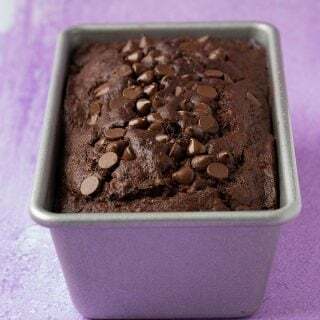 Bake brownie for about 30-35 minutes or until cooked through. It should have a nice cracked top and no longer wobble in the middle. Leave to cool completely. In a large mixing bowl, add coconut, sugar, sweetened condensed milk and vanilla and gently fold together. Once the coconut is nice and wet, spread the mixture over the cooled brownie to form an even layer. Press roasted almonds on top. Place brownie in fridge for 15 minutes. Melt milk chocolate in the microwave, stirring in between 20 second bursts. Once the chocolate is completely melted, pour over the coconut, ensuring it covers the entire brownie. Then pop brownie back into the fridge and leave it to set for at least two hours. Cut into small squares with a sharp knife to serve. To prevent the chocolate from cracking, dip the knife in boiling water and wipe dry with a paper towel in between each cut. 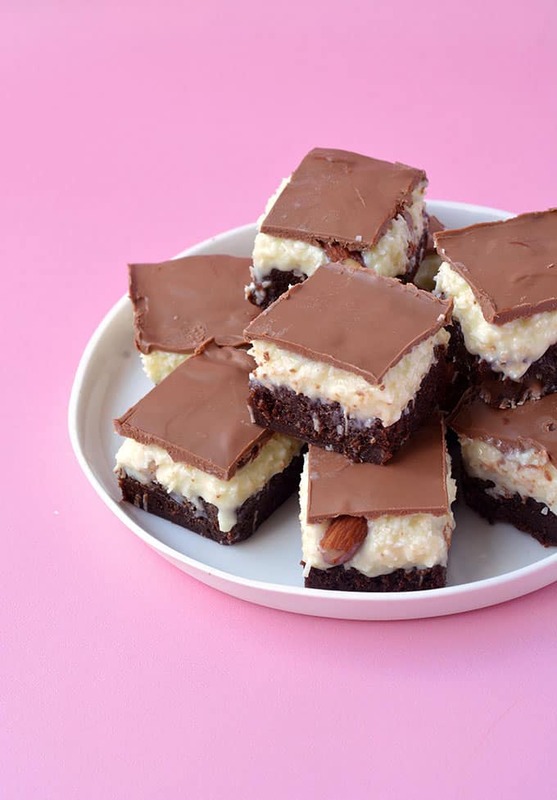 This recipe was first published on Sweetest Menu in September 2015. I looooove Almond Joy! These brownies bars look so good! These are the best brownies! Thanks Josh! Glad you enjoyed them! Every time I read Almond Joy my heart skips a bit – is my favorite mix of flavors. But it never occured to me to add it to brownies, well done! Thanks for inspiration! I can’t resist anything almond joy! Can’t wait to try these brownies! Thanks Jess! I hope you get to try them!! These brownie bars look and sound delicious, will definitely have to try this recipe soon. Thanks Fida! I hope you get a chance to try them! Talk about an amazing execution of candy bar flavors turned brownies here!! 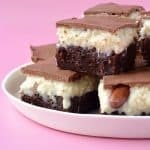 You have combined some of my favorite flavors here with the coconut, chocolate, and almonds and turned into one indulgent treat I just know I wouldn’t be able to resist! Classic brownies are already a weakness for me…hand me a pan of these and I’m in for some trouble!! 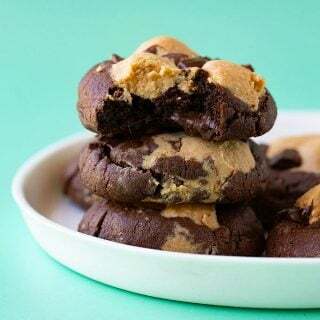 These look absolutely decadent, Jess. I love how neat your layers are too – impeccable! You are so sweet Beeta! I can tell you, they were so delicious! 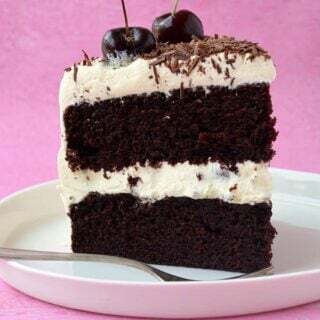 I wish I had a piece right about now! Oh, boy! Now you’ve done it! 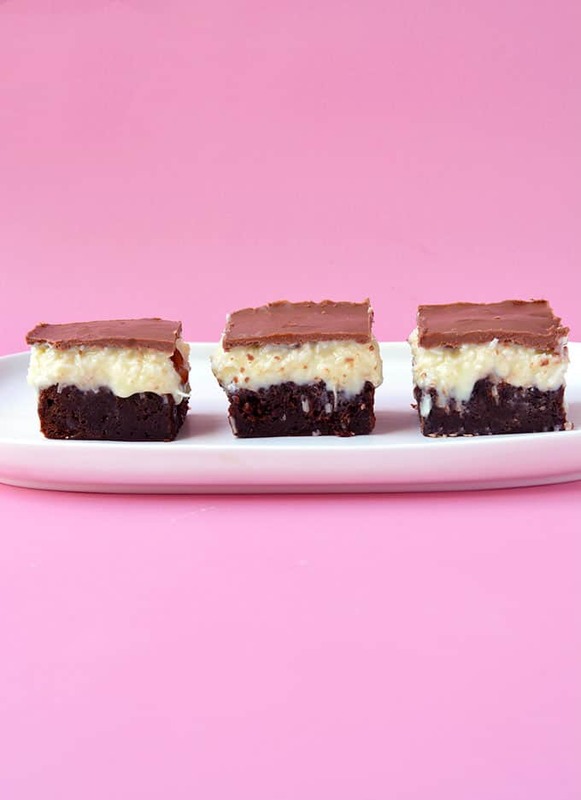 My favorite candy bar transformed into brownies. LOVE these!!! Agh! Everything about these brownie bars is just SO awesome!!! Talk about delicious. Seriously Jess, you take everything to the next level. Love it! Thanks for linking up with Fabulous Foodie Fridays! Jessica! I am a bounty bar bandit! I love them! They always make me think of my Dad because he loves them too. I guess that means I have double the reason to make these gorgeous brownies. Oh layer upon layer of deliciousness! I need to get myself some almonds and get to the kitchen pronto! Also, Almond Joy bars are now on my ‘must try when we hit the US’ list! Oh boy… You know I love me some Almond Joy! These are not only adorable, but I’m sure they’re even tastier than they look! Oh my god! Those brownies look insane in the best way possible. Oooooooo! We must be on a similar baking brainwave because I made something similar to this yesterday… brownies in a muffin tin with a coconut macaroon type topping. These look WAY better though haha!